Money Market Tips: MONEY MARKET- WHAT MR. RAGHURAM RAJAN SAID ABOUT RUPEE IN NEW YORK. MONEY MARKET- WHAT MR. RAGHURAM RAJAN SAID ABOUT RUPEE IN NEW YORK. New York: The Reserve Bank of India will continue to use currency intervention to reduce volatility in the country's exchange rates, the bank's Governor, Raghuram Rajan, said on Monday. "There is a school of thought that says: Let the exchange rate move wherever it will," said Mr Rajan, at the Inaugural Kotak Family Distinguished Lecture held at Columbia Law School in New York. "That's something we could do," Mr Rajan said. "But in emerging markets, with institutions not as strong as industrialized countries, you find there are collateral effects of both the capital moving in and going out." India will intervene in the currency market when there's a sustainable risk in global markets and the country sees a flood of capital coming in, he said. "We really don't want the currency to move only as result of capital flows," Mr Rajan said. "We would like it to be more focussed on the underlying fundamentals of trade and services." India's foreign exchange reserves swelled to a record high of $360 billion for the week ended April 1, largely on account of the central bank's dollar purchases to rein in the rupee's strength as foreign funds poured into Indian financial markets. 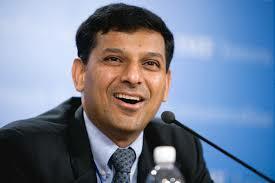 Mr Rajan confirmed that India's reserve build-up was a result of the central bank's intervention. "So we let the exchange rate move, we never stand in the way, but we pick up some as flows come in," he added. The central bank governor said he was closely watching inflation developments as well as monsoon rain forecasts in terms of impact on monetary policy. "As evidence of inflation and monsoon build one way or the other, this will give us more information about the direction of monetary policy," Mr Rajan said. "We're still in an accommodative mode. Precisely when and by how much we will raise interest rates, we will have to see." Earlier this month the Reserve Bank of India cut its key lending rate by 25 basis points to 6.5 per cent. India's monsoon in the past two years has been poor, resulting in some drought, but the La Nina weather phenomenon this year is expected to produce a better monsoon. A third consecutive drought would have meant a spike in food prices, plunge in purchasing power of the rural economy, and slower economic recovery overall.